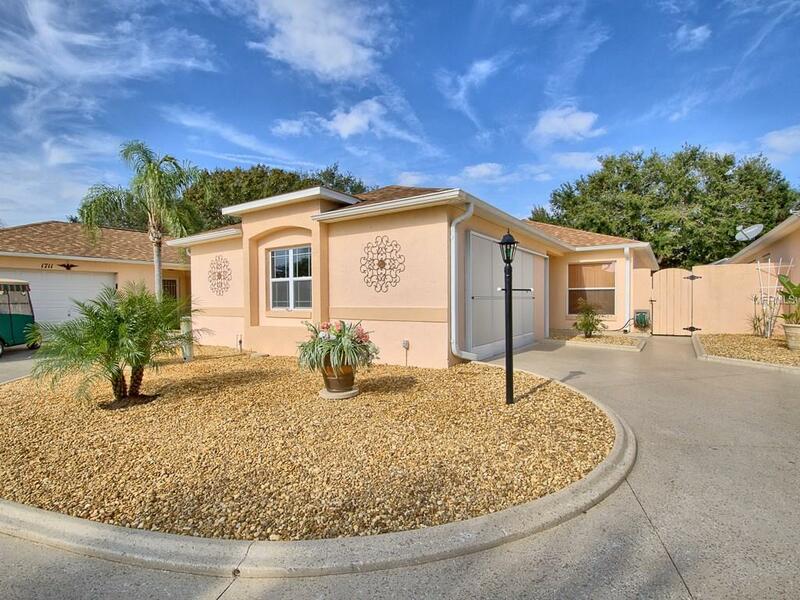 Located in the VILLAS OF DE LA VISTA SOUTH, this IMMACULATE & AFFORDABLE, CBS COURTYARD VILLA with 2 BR/1 BA and a SOLAR HEATED SWIMMING POOL has everything on your checklist for the perfect LOW MAINTENANCE home with the unmatched VILLAGES LIFESTYLE. For starters, it has a super CENTRAL LOCATION near 4 recreation centers & numerous golf courses plus Hacienda Hills & Tierra Del Sol country clubs. Best of all, Lake Sumter Landing & Spanish Springs town centers are a short golf cart ride away so you can enjoy FREE live entertainment nightly. This MOVE IN READY villa is awaiting your arrival! The list of updates is long! It has fresh INTERIOR PAINT, CROWN MOULDING, CERAMIC TILE FLOORS in main LA & wet areas, NEW CARPET in bedrooms, newer appliances plus a NEW WASHER & DRYER. A HUMIDISTAT and 3M PROTECTIVE FILM on the windows keep your interior temperatures comfortable while increasing energy efficiency. Roof replaced with ARCHITECTURAL SHINGLES (2012). Attic has PULL DOWN STAIRS, RADIANT BARRIER & extra insulation. Garage door is insulated. Garage floor, driveway, sidewalks, and pool deck have been recently painted. There is a NEW SALT WATER POOL SYSTEM w/ 9 SOLAR HEATING PANELS & AUTOMATIC POOL SWEEP EQUIPMENT to make pool maintenance so easy. And the LOW MAINTENANCE LANDSCAPING with rock filled beds allows you plenty of leisure time. Call today for your private showing! Dont miss this great opportunity for a VALUE PRICED, like new home! Additional Lease Restrictions No Person Under 19 Years Of Age May Reside For More Than 30 Consecutive Days.